Use to purify the area before any ritual. Use for consecration and purification of magickal tools, talismans etc. Also used in Ceremonial Magick. "Intellectual powers, study, communication, to help conquer drug addiction." "Traditionally used in rituals for transformation and change, longevity and past life regression." Use as a general purpose oil to purify and consecrate, talismans, candles and ritual tools. 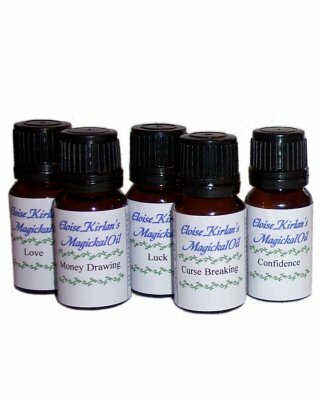 "A general purpose anointing and blessing oil, for anointing candles, talismans etc." "To increase love and sexual desire." "To assist in projecting the astral body." "To attract love, money, wealth, opportunities etc." For spells and rituals to enhance beauty. "For Wiccan rituals on Beltane (April 30th) or May Day (May 1st) or simply to attune with the changing of the seasons and for good fortune"
"To attract customers, increase business. Also helpful if your income relies upon tips or gratuities." To purify your altar and raise power for any magickal workings. "To assist chakra balancing meditation." "For general work in your circle, a general purpose ritual oil for anointing candles and ritual objects." Helps express compassion and increase capacity for compassion. "To increase confidence in your own abilities." Anoint your magickal tools, crystals, jewellery etc to purify and consecrate them. "To increase your courage before nerve-wracking situations." "To stimulate your creative energies." "For cleansing gemstones of negative energies - can be used in conjunction with any crystal purification rituals." "For breaking curses, returning a curse to sender and banishing negativity." " Use during Dark Moon rituals." Use to increase determination and perseverance. "Assists all forms of divination including Tarot cards, runes, runic dice, pendulum, etc." Use for situations where you feel you need divine intervention. "To help in remembering dreams"
"For money, stability, business success and fertility"
To help heal emotional pain and trauma and bring peace and tranquillity. Use when you need others to forgive and forget or to help you to forgive yourself and others. "To help lift your spirits." For rituals to increase, maintain or help restore peace and harmony in the home. "To speed healing . Or use in any healing rituals or spells"
Use to encourage honesty and truth. "To banish feelings of negativity and give hope." Use for Wiccan rituals, especially when honouring the Horned God. "For Wiccan rituals on Imbolc (February 1st) or simply to attune with the symbolic rebirth of the Sun." Use when honouring Isis or for Egyptial rituals and spells. Use for any positive magickal goal. "For spells for wealth, business, riches, luck, expansion and legal matters." For night rituals and magick and to honour Egyptian gods and goddesses especially Isis. Can also be used as a general purpose oil. Use for rituals to promote long life and health. "To strengthen an existing love or use to attract love into your life." "For luck in games of chance, gambling." "For Wiccan rituals on Lughnasadh (August 1st or 2nd) or to attune with the coming harvest." "For Wiccan rituals on Mabon (Autumn Equinox, circa September 21st) or to attune with the changing of the seasons." "For attracting things to you, eg. money, love, luck, etc." "For physical strength, power, competitions, lust." "Use prior to meditation to relax the conscious mind." To enhance memory - especially useful when studying for examinations and tests. "For Wiccan rituals at the Summer Solstice (circa June 21st) or to attune with the seasons and the Sun." "For psychic workings, love magic, healing, dreams." " Use during New Moon rituals." For honouring the Goddess and God. "For Wiccan rituals on Ostara (the Spring Equinox circa March 21st) or to welcome the spring and the renewal of life." For rituals to help you succeed when faced with obstacles and difficulties or when all the odds seem stacked against you. To relieve stress and banish feelings of anger. For peace and tranquillity. Use for rituals to increase prosperity and financial security. "For physical and psychic protection." Use in rituals for psychic protection and to strengthen your "psychic armour". "To purify the atmosphere of a disturbed home"
Use in rituals to attract riches and honours. "Use when using runes for divination or for magickal workings." "For Wiccan rituals on Samhain (October 31st)"
"For studying past lives, banishing"